Radiation Therapy provided close to home by an expert team of compassionate, dedicated professionals using the most advanced technology. Radiation therapy is an essential part of many cancer treatment plans. One of the most important components of radiation therapy involves the complex process of treatment planning. Our board certified radiation oncologists, medical physicist and dosimetrist use computed tomography scans and sophisticated computer programs to create three-dimensional images of the tumor, including the size, shape and location. Equipped with this information, the radiation therapy team determines the amount of radiation (dose) and the best way to focus the radiation at the cancer cells. Once treatment planning is complete, our certified radiation technologists accurately deliver the treatments. Your treatment team includes radiation oncologists, radiation therapist, medical physicist and medical dosimetrist and our receptionist/secretarial staff. Kona Community Hospital’s radiation therapy department has a Varian 21 EX® S, a state-of-the-art digital linear accelerator with integrated imaging capabilities. It is the first advanced multi-functional linear accelerator with intensity modulated radiation therapy (IMRT). The result is unmatched clinical confidence, enabling more aggressive treatment of tumors while minimizing damage to surrounding healthy tissue. The Varian 21 EX® enables our radiation oncologists to perform conventional radiation therapy. Varian Esclipes® (X-ray Volume Imaging) technology enables visualization of soft tissue detail in any area of the body to create a accurate dose distribution to tumor and critical structures. Conformal (3D) treatment planning uses three-dimensional imaging information to visualize the target and critical structures so that an optimal treatment plan can be designed. 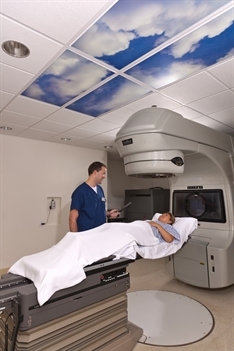 Combining the highest level of patient comfort with fewer side effects than standard radiation therapy, IMRT is a highly accurate radiation instrument that spares normal tissue, allows for superior dose distributions, and is able to treat tumors near critical structures. Intensity modulated radiation therapy (IMRT) offers patients the most effective treatment for each type and stage of cancer. IMRT uses small beams to treat a tumor from different directions and with varying intensity, while limiting the radiation dose to surrounding healthy tissue. The Radiation Oncology clinic is open Monday through Friday, 7:00 am to 3:30 pm. To contact the Radiation Oncology clinic or schedule an appointment, please call (808) 322-6910, option 3 or fax (808) 322-5849.